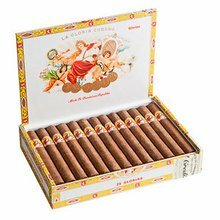 The King of all La Gloria Cubana Cigars is in the house! A delicious balance of aged Dominican and Nicaraguan filler leaves are nestled within a dark, earth colored Ecuadorian wrapper. This full, rich, creamy, and stout Presidente will demand all of your attention, so be sure to clear your calendar before attempting to smoke a Soberano. Packaged in a box of 25. You know that great feeling you get after you've had a delicious steak? Yeah, you'll have that same feeling after you smoke this. Not bad of a smoke. Worth the investment. Nice blend nice flavor nice construction. It has a nice finish. LGC is one of the best smoke out there. Lots of flavors. Great construction with decent ash. Would recommend to anyone. 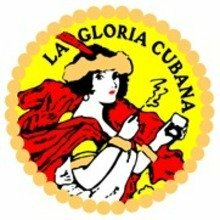 Always a fan of La Gloria Cubana, these cigars did not disappoint me in any way. Absolutely fantastic. I'll definately be keeping a few if these in the humidor!! Wonderful full body cigar, this is a nice long smoke with awesome flavors, solid construction and long ash. I am a pretty big LGC fan and this one here is no different. Great flavors that work well and great burn an construction. I was first introduced to this cigar by a friend of mine while traveling up to the wine country of Northern California. Our wives stayed in the hotel while we went out into the warm summer night beneath a tree. We lit our huge cigars and from the first puff I was hooked. So tasty and good! This delicious smoke lasted for more than two hours, and I became a huge La Gloria Cubana fan. 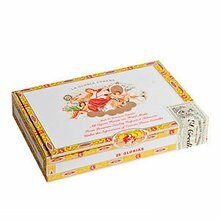 I purchased a box of smoked with my nephew and other friends. It a massive hit and goes great with scotch or bourbon. Try one! Really enjoyed this smoke. It left a great after taste that was very distinct. It had that sweet and earthy taste and the smoke filled the room on it. The construction was very nice and it smoked amazingly. Never burned uneven for me. Decent cigar but nothing great. It's a nice long smoke so you need a lot of time. Construction was okay, but flavor disappointed.